MTN Surprises us yet again with yet another attractive plan, MTN all night browsing, isnt this something else now, MTN is saying with just #25 you get to browse free of charge all night long, download whatever you want, but then I must warn you it seems to be capped at 500MB so dont be fooled with the term all night. MTN is offering an all night browsing for just a token of N25. As enticing as this looks, dont be fool there’s an embargo of data restriction. The data allocated isn’t unlimited (so don’t get your hopes high). It’s capped at 500MB and is usable between 12:00am and 4:00am. How To Subscribe for MTN Night Plan? First and foremost you need to migrate to MTN Pulse plan in order to be eligible for this offer. 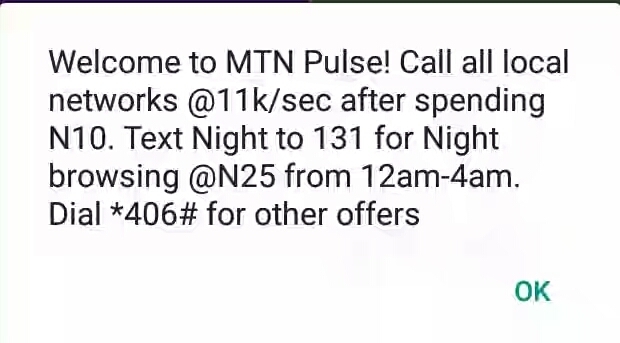 To migrate to MTN Pulse, dial *406#. After successful migration, have a minimum of N30 -#25 airtime balance and send ‘Night’ (without quotes) to 131 and N25 will be deducted; However the data cannot be accumulated neither can you subscribe more than once at Night. Remember, data allocated is 500MB for the sum of N25 usable from 12am to 4am.